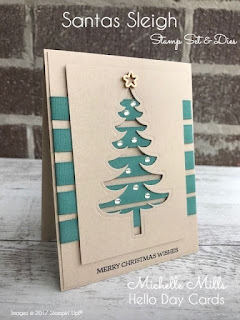 When scrolling through Pinterest recently (as you do), I came across a card that was a little different........and I fell in love. I was on the search for something different, something I hadn't tried before. Funny, this particular card I chose to CASE wasn't even a Stampin' Up! card! The original I saw on Pinterest used White Ribbon and as I didn't have the cotton ribbon in white I wanted to use, so I substituted it for the In Color "Tranquil Tide". I really wanted to keep the "natural" look of the card so I chose a Wooden Element for the top of the tree as opposed to some bling as there is enough bling on the tree. I love the color combo of this card too....it really grabs me. I would imagine this would also look good in a striking red.